Have the No. 8 Buckeyes solved their running game problems? COLUMBUS, Ohio (AP) — After seeing its two star running backs shut down by a series of less talented opponents, No. 8 Ohio State finally managed to break them loose on Saturday. It was a timely development, as the Buckeyes this week prepare to face the top defense in the country against the run. 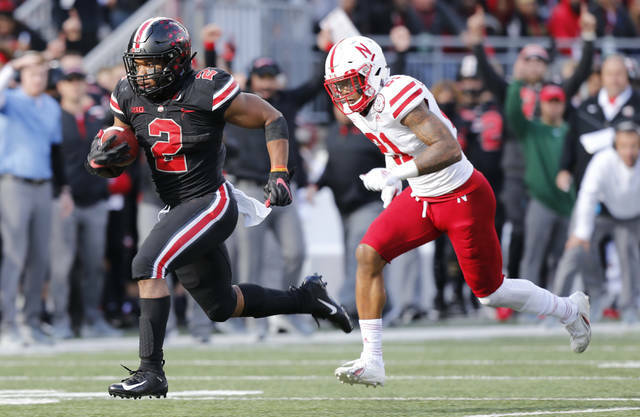 J.K. Dobbins had his best game of the season, rushing for 163 yards and three touchdowns and then picking up two first downs on the final drive to seal the 36-31 win over Nebraska. Mike Weber turned in his best performance since the first game of the season, gaining 91 yards on nine carries. The improvement in the run game coincided with Ohio State (8-1, 5-1 Big Ten, No. 10 CFP) all but abandoning run-pass option plays, which are designed for a run or a pass based on the quarterback’s immediate read of the defense. Offensive linemen had acknowledged that those plays made run blocking more difficult. “That was part of the hours and hours and hours of (figuring out) how do we get those two guys involved in the game and let them drop their pads and go do what they do best, which is run the ball,” coach Urban Meyer said Monday. All five offensive linemen collectively were named offensive players of the game. The Buckeyes this week visit Michigan State (6-3, 4-2), which is holding opponents to an average of 71.7 yards game and 2.53 per carry. Spartans linebacker Joe Bachie ran wild in last week’s win over Maryland, making seven tackles, including two for a loss, forced three fumbles, broke up two passes and recovered a fumble in earning Big Ten defensive player of the week honors. 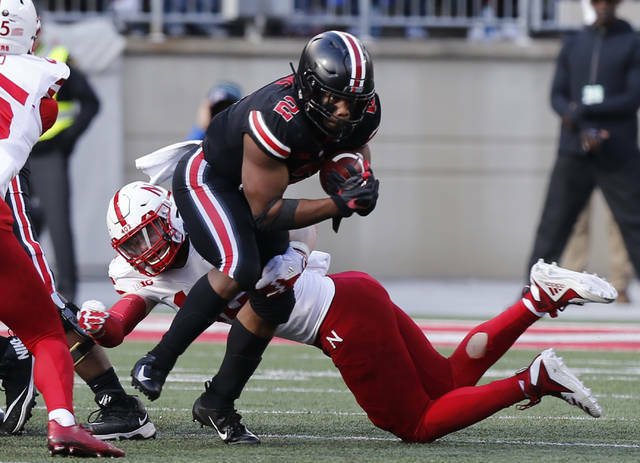 The beleaguered Buckeyes’ defense found itself in another tight spot Saturday when safety Jordan Fuller was ejected in the first half for targeting. The other starting safety, Isaiah Pryor, already was out with a shoulder injury and starting cornerback Jeffrey Okudah was sidelined with a pulled groin. Enter Brendon White. The sophomore who’d previously seen limited playing time came in and took over, finishing with a team-leading 10 solo tackles and three assists, including three tackles for loss. He went from being just another guy on the sideline to defensive player of the game. “It’s a dream come true, actually,” said White, who went to high school 17 miles up the road at Olentangy Liberty in Powell, a Columbus suburb. Meyer said White will play more with Fuller and Pryor back this week, but how much is still to be determined. White’s father was a 1987 Ohio State captain and an all-Big Ten defensive back who went on to have an 11-year career in the NFL. William White delivered a message on the Ohio Stadium scoreboard earlier in Saturday’s game about his fight with amyotrophic lateral sclerosis. Quarterback Dwayne Haskins Jr. had his fewest yards passing since Week 2, which is probably a byproduct of the Buckeyes getting the run game unglued. 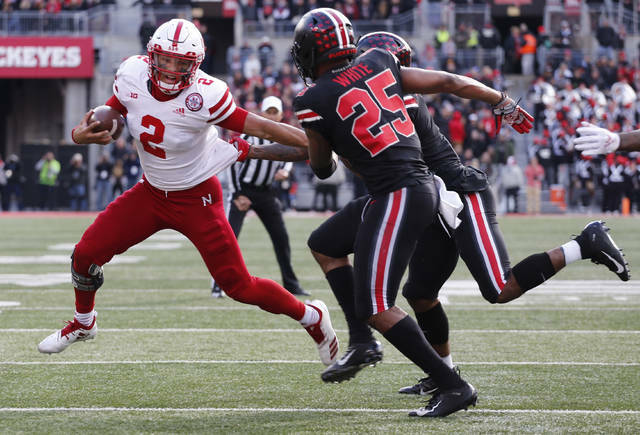 He completed a little more than half his passes against Nebraska for 252 yards and two touchdowns. One of those, a little shovel pass to Parris Campbell on a jet sweep, basically was a run play. He also lost a fumble and threw an interception in the end zone. He is still third in the nation in passing yards (3,053), is tied for the lead in touchdown passes (32) and is on track to break single-season school records for passing. This story has been corrected to show that Michigan State is holding opponents to 71.7 yards per game, not 255.